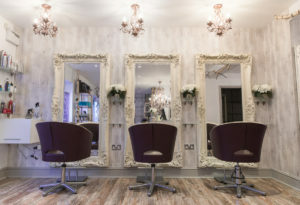 Following my experience competing on this year’s BBC2 amateur interior designer series, The Great Interior Design Challenge, I was approached to design a new interiors scheme for local boutique salon Hair by Kirby Blythe, based in Messingham. 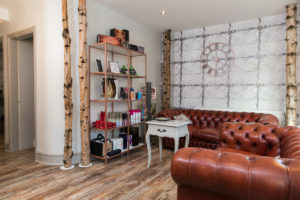 The owner’s brief was to create a fresh and feminine scheme to increase light and introduce a spa feel where customers would feel welcomed and relaxed. 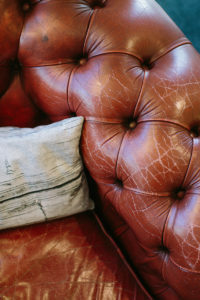 Light grey, rose gold and white tones were used throughout to complement the existing flooring and vintage chesterfield sofas. Rose gold chandeliers above each station and a huge rose gold chandelier above the reception desk added glamour, whilst the white tones of the washed wood, marble and tin tile wallpapers added much needed light and ticked the clean, spa feel of the client brief. 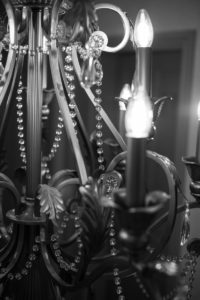 I love the sourcing aspect of creating interiors, always a great excuse for trauling flee markets and a bit of internet shopping to find the perfect items! For this project I sourced a reclaimed marble fire surround, to house a flameless fire, which was incorporated into the reception desk to welcome clients on arrival. Wow factor was added with the addition of floor to ceiling real silver birch poles, supplied by decorativebirch.co.uk. 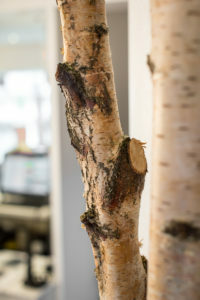 The silver birch theme was echoed within the salon windows, where existing window decals were removed and large branches used to create bespoke light fittings using Ikea fittings. 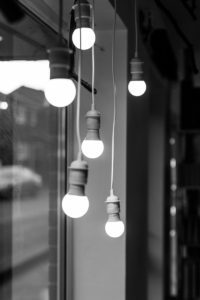 These perfectly complement the bespoke light boxes which showcase award winning work by salon owner Kirby Hickey and her creative team. 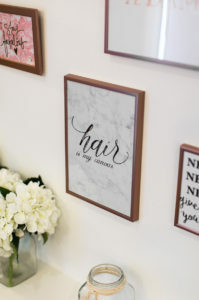 Finishing touches included a gallery wall, complete with rose gold frames and feminine prints in marble, blush pink and rose gold, created by Lisa Jayne Creative. 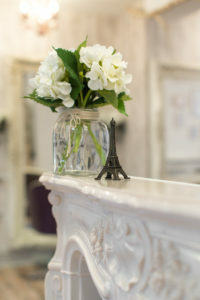 White hydrangeas in simple glass jars were added to complement the scheme.